1. What is a waitlist? How do I sign up for a waitlist? When no seats are available in a course (i.e. course is closed or full), you can sign up for a waitlist, when available. Signing up for a waitlist 'holds your place in line' as you wait for a seat to open up. When a seat becomes available in a course with a waitlist, the first person on the waitlist is given the opportunity to register for the open seat. 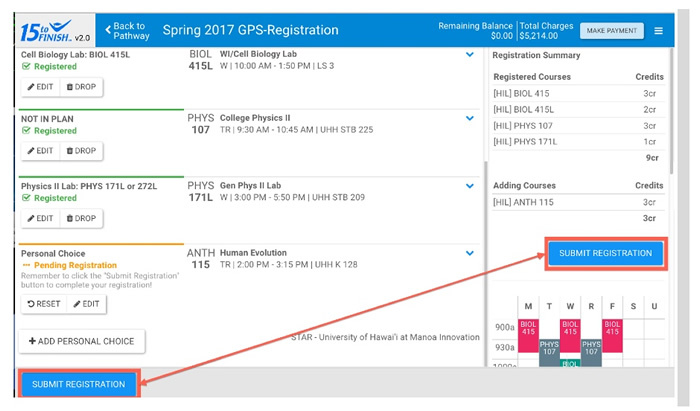 You can now see courses that have “No Seats/Waitlist Only”. These are courses that do not have open seats, but for which a waitlist is available. 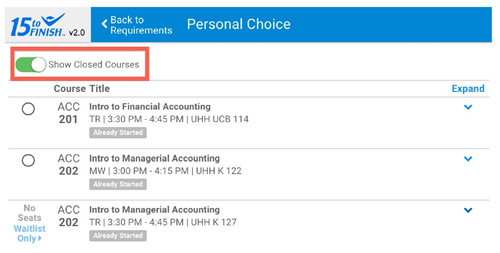 To sign up for the waitlist, choose the blue “Expand” arrow to the right of the course. At the bottom of the expanded course information, choose “Waitlist this Course” to sign up for the waitlist. If a seat becomes available and you are the first person on the waitlist, an email will be sent to your @hawaii.edu address. Be sure to check this account on a regular basis. 2. I received an email saying a class I was waitlisted for has a seat available for me. Does this mean I am registered for the course? If not, what do I do now? If you received an email stating a class you were waitlisted for has a seat available, you will still need to register into the course. You will need to login to your STAR-GPS and choose “Move to Cart” below the course with the available seat. If the course is not listed, you will need to add the course to your cart by clicking on "Select a Course for this Requirement" and selecting the course from those listed. Once this course is in your cart, choose "Submit Registration" to register for the course. 3. I received an email saying a class I was waitlisted for has a seat available for me, but I am still unable to register for the course. Did you attempt to register for the course before the deadline in the email you received? Seats are held for a set time period before being offered to the next person on the waitlist. If you did not meet this deadline and still wish to take the course, you will need to sign up for the waitlist again. Do you meet the course prerequisites/co-requisites? You are still required to meet all the prerequisites/co-requisites for a course, even if a waitlisted seat becomes available to you. Does the course conflict with other courses on your schedule? If it does and you wish to keep the course it conflicts with, you will need to obtain a Time Conflict Override to register for this course. Do you have any holds on your account? Holds will prevent you from making any changes to your schedule. You will need to clear these holds before adding the waitlisted course. If none of the above apply to your situation, and you are still unable to register for the course, contact the Office of the Registrar at (808) 932-7447 for further assistance. 4. How Do I access the STAR GPS System? To access your STAR-GPS, click on the STAR block in your University of Hawaiʻi MyUH MyUH Services. You will be prompted to login using your UH username and password to enter STAR. Video tutorials and further information on how to use the STAR-GPS system can be found on the UH Hilo GPS website. 5. Why does it state that my registration is pending? If your registration is pending as in the image below, it means you have selected a course for the requirement, but have not yet registered. Until you have registered, another student may register for the course you have selected. To register for courses that are pending, choose the “Submit Registration” button. A pop-up will confirm your registration or state any registration errors. If registered, you will notice the “Pending Registration” message has been replaced with “Registered” as below. 6. Why is STAR asking for a PIN? How do I find my PIN? Students with priority registration (students with disabilities, student veterans, and student athletes) are required to enter a PIN number as part of their Pre-Registration Checklist each time they access the registration system. If you are being asked for a PIN, contact the appropriate department for this information: students with disabilities please contact University Disability Services, student veterans contact the Office of the Registrar, and student athletes contact your respective coach(es). 7. How do I drop a course? Will I receive a W grade? You can drop a course in the STAR-GPS system before deadlines posted in the Academic Calendar. You will receive a W grade if the course is dropped after the ‘Last Day to Drop A Class Online without “W”’ deadline. To drop a course, login to your STAR-GPS and choose the “Drop” button for the course you wish to drop. Choose “Submit Registration” to process these changes to your schedule. 8. I received an override from my professor, but still see an error in GPS. How do I register for this course? To re-submit courses for registration, click on the “Submit Registration” button again. If you are now eligible to register for the course (e.g. you received an override), the registration error will clear and you will see a green “Registered” below the course. 9. How do I register for courses at other campuses? To register for courses offered at other campuses, you will need to use the search feature in STAR-GPS. 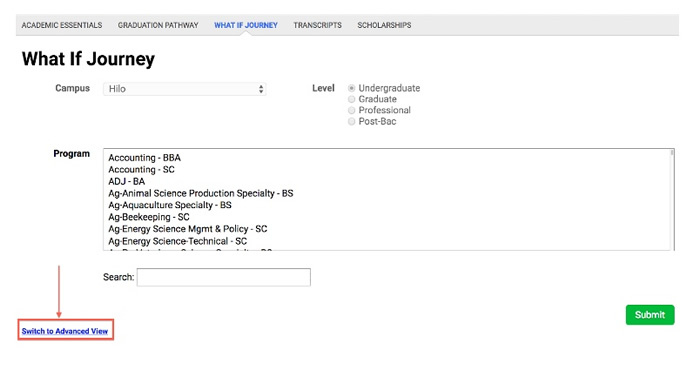 When viewing available courses for a requirement, you can select other campuses from the dropdown menu. This will display the courses being offered at the campus selected. Note that prerequisites vary from campus to campus and you will need to meet the course prerequisites listed for the specific course/campus for which you are attempting to register. Please make sure you check the Registration Timetable for your registration time for each campus as times may be different. A prerequisite is a course or another requirement that you are required to meet before you are eligible to register for a particular course. You may be receiving a prerequisite error if you are trying to register for a course that you do not meet the prerequisites for. The prerequisites for a course can be found by activating the blue “expand” arrow on the right side of a course. Corequisites are courses that are required to be taken at the same time. You will need to register for corequisite courses together. Corequisites can be viewed by clicking on the blue “Expand” arrow to the right of the course. 10. What if I am not pursuing the major listed in my STAR? To officially change your major, you will need to submit a completed Change of Major Form to the Office of the Registrar. Until this form is processed, you can run a What If Journey in STAR to view the requirements for programs other than your declared major. It is recommended you then click on "Switch to Advanced View" at the bottom of the page. You will then be able to enter information for the program whose requirements you wish to view. Click on Submit to view the Academic Essentials and GPS Registration pathway for the indicated program. You can register while in a What If Journey. 11. What if I am pursuing a: a) 2nd Major, b) Minor, c) Certificate? How do I register for these required courses? Currently, STAR cannot display the requirements for two programs simultaneously on your GPS Registration pathway. Follow the instructions below to view the requirements for your 2nd major, minor, or certificate and/or to manually add these requirements to a GPS Registration pathway. Minor:If declared, you can review the requirements for a minor below your major in Academic Essentials. 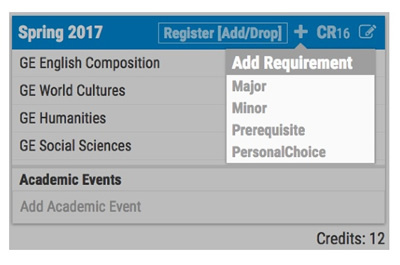 Courses for your minor can be manually added to your GPS Registration pathway by clicking on the + on the upper right corner of the appropriate term and selecting the corresponding requirement. 2nd Major or Certificate: If declared, you can view the requirements for your 2nd major or certificate by selecting this program from the drop-down menu at the top right of your STAR Academic Essentials. You can then use the GPS Registration pathway to view/register for the courses recommended for this program, if available. If a corresponding Pathway is not available, you can view the requirements in Academic Essentials, and add these to the Pathway as illustrated above for minor coursework. 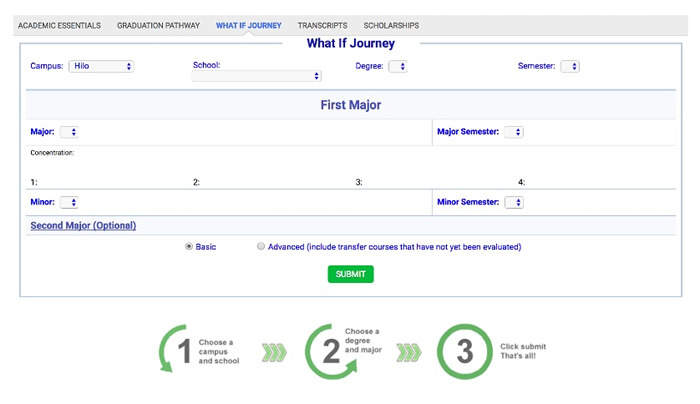 If you have not yet declared your 2nd major, minor, or certificate, you can view the requirements for these programs by using the “What If Journey” in your STAR. Refer to the above response to “What if I am not pursuing the major listed in my STAR?” for further information. 12. What does "See Academic Essentials tab for Graduation" at the bottom of my pathway mean? You will need to click on the Academic Essentials tab in order to check that you have met all of the UH Hilo requirements for graduation. Some Integrative graduation requirements such as the Hawaii Pan-Pacific (HPP), Global Community and Citizenship (GCC) or Writing Intensive (WI) courses do not show as separate requirements within GPS registration. All students will need to meet these requirements for graduation. 13. GPS is too confusing. Can I register the old way, through MyUH? All UH Hilo students have been transitioned to the STAR-GPS system beginning with Early Registration for Fall 2017. If you experience technical problems not addressed in the FAQs, please contact the Office of the Registrar for further assistance. 14. Who can I contact if I get stuck and need assistance? For technical issues not addressed in the FAQ's, please contact the <Office of the Registrar for assistance. For questions regarding course selection and academic planning, please contact your assigned advisor. Freshmen and General-Undeclared students are advised by the Career & Academic Advising Center. 16. How do I find out what textbooks I need? How much will it cost? Once you have registered for courses, you can view the required and recommended textbooks for your courses by clicking on the three bar menu icon in the upper right and selecting Textbooks from the drop-down menu. This will take you to the UH Hilo Bookstore comparison tool, which provides you with a listing of required and recommended books, as well as price comparisons. If you are not yet registered for a course, visit the UH Hilo Bookstore webpage for textbook information. 17. How do I pay for my tuition? What if I am on Financial Aid? To make a payment click on the “Make Payment” button. You will then see a pop-up with the breakdown of your charges. Click on the “Make Payment” button at the bottom of this pop-up and follow the instructions on screen. For information on accepted payment methods, financial aid disbursements, and other payment processes, refer to the Cashier’s Office website. 18. How can someone (e.g. parent, grandparent) pay my tuition for me? Do I need to give them access to my account? You can set up your parent or other individual as an Authorized User on your account. Information on setting up an Authorized User can be found on the UH System website. 19. How do I register for a Directed Reading or Research course? To register for a directed reading/research course (199V, 299V, 399V, 499V), you will need to submit the original completed Directed Reading or Research Course Form to the Office of the Registrar in SSC-E101.